Menterra Venture Advisors said on Tuesday it has launched its maiden fund in India with a corpus of Rs 40 crore (about $6 million). The Menterra Social Impact Fund I will invest Rs 1 crore to Rs 4 crore in early-stage social enterprises in education, health, agriculture and energy sectors. The focus will mainly be on health and education ventures, the firm said. Menterra Venture was founded in August last year by Mukesh Sharma, Paul Basil and PR Ganapathy. It got approval from the Foreign Investment Promotion Board to bring in overseas investment of Rs 21.2 crore ($3.2 million) in December. The remaining amount will be raised locally, the firm said, adding that the entire amount will go into a single pool and won't be split into separate entitites. Sharma has a decade of experience in private equity and investment banking and serves as managing director of the firm. Basil founded social enterprise incubator Villgro in 2001 and serves as advisor at the firm. Ganapathy, who is president at Villgro, also works as an advisor at Menterra. The fund counts Meenakshi Ramesh from Pratham Education Foundation, Chandu Nair and Gautam Gode in its board. Nair is the co-founder of Scope e-Knowledge Center, a Chennai-based knowledge process outsourcing firm, while Gode is a co-founder and managing director at Samara Capital. Menterra also has Vijay Mahajan, founder and CEO of the BASIX Social Enterprise Group, and Kanwaljit Singh, founder of Fireside Ventures, as investment advisors. The company has secured investments from Nair and Meenakshi, who will also be promoters of the social impact fund, and international organisations such as The Lemelson Foundation and the Michael & Susan Dell Foundation. “Existing capital for social enterprises either comes in very small ticket sizes or very large ticket sizes at the later stages of a company’s life cycle, so there has been a big missing middle. Menterra hopes to fill this gap between friends-and-family investment and first round Series A investment,” said Basil. 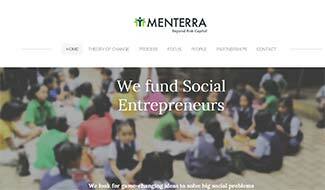 Menterra said it will work closely with Villgro to fund for-profit social enterprises in India. The company said that entrepreneurs will have the benefit of a spectrum of funding starting at Rs 10 lakh and going up to Rs 4 crore, as well as a host of other services between the two companies.